Elizabeth April Friesen was born on April 18, 1929, to Abraham & Helena (Bergen) Klassen. She spent her childhood years growing up in the Tiefengrund District of Saskatchewan and attended the Tiefengrund & Riverlot Schools. 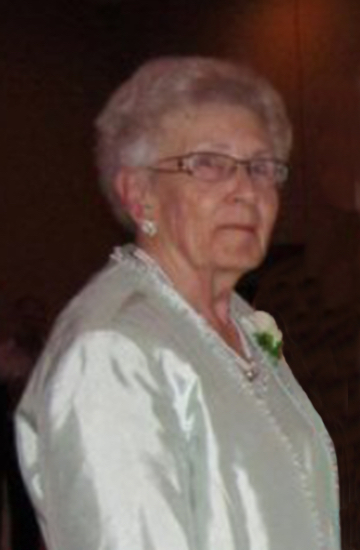 For grades 11 & 12, she attended Rosthern Junior College, where she graduated in 1948. After graduation, she went to British Columbia to work as a nurses’ aide with her sister, Helen. Elizabeth was baptized on June 22, 1947, at the Tiefengrund Rosenort Mennonite Church. On November 11, 1949, she married Helmuth Peter Friesen. Their marriage was blessed with four daughters and four sons and their families, including 20 grandchildren, 25 great-grandchildren, and 2 great-great-grandchildren. Elizabeth passed away on July 15, 2017, at the age of 88 years. She is survived by her four daughters, Myrna, Carrie, Sylvia, & Connie; four sons, Wesley, Leon, Harlan, & Darcy and their families; her siblings, Benno, Johnny, & Margaret and their families. She was predeceased by her parents, Abraham & Helena Klassen; her first husband, Helmuth; her second husband, Peter; and her siblings, Helen Klassen, Peter Klassen, Nettie (Peter) Wiebe, Tena (Jake) Janzen, Mary (George) Adrian, Jake Klassen, George (Berta) (Bonnie) Klassen, Abe Klassen, Ike Klassen, Francis Klassen, & Geraldine Klassen. The Funeral Service will be held on Monday, July 24, 2017, at 11:00 A.M. at Mount Royal Mennonite Church, Saskatoon, SK, with Pastors Garth and Claire Ewert-Fisher officiating. Interment will take place at Tiefengrund-Rosenort Cemetery. Just wanted to tell you how much your Mom was appreciated when they lived in the community at Venn. She belonged to our Birthday Club and was a very social and special person and I know that her caring personality was felt by everyone at the Manitou Lodge, when she worked there. I am so sorry to hear about the loss of a lovely lady! She treated me very very well while I nursed at the nsg home!